he is the subject of various Arts and Crafts. 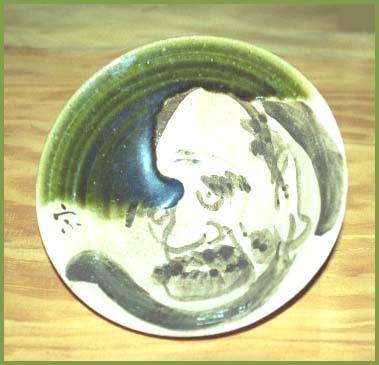 Oribe pottery is not named after an aera, like most Japanese ceramics, but after the person who started the tradition. Lets meet Furuta Oribe 古田織部 (1544 -1615). He was a samurai and also a famous tea master. He was born in Mino (today Gifu Prefecture). He lived during troubled times of Japanese History and served Oda Nobunaga, Toyotomi Hideyoshi and also Tokugawa Ieyasu. But then he sided with the Toyotomi Clan and was ordered to commit seppuku by Ieyasu in 1615. Oribe's tea master was the famous Sen no Rikyu, but the eccentric Oribe soon started his own way of serving tea, the Oribe Way (Oribe-ryuu) and also tought the Tea Ceremony to Ieyasu's son, Hidetada. 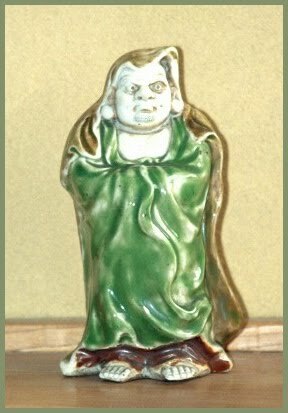 He soon began to make his own tea utensils and other pots and plates to serve food in a unique pottery style with a green glaze and unusual forms to suit his whims. His most famous disciples are Kobori Enshuu and Hon-ami Kooetsu. was invented by Oribe for his tea garden, to give it a warm and elegant touch in winter. 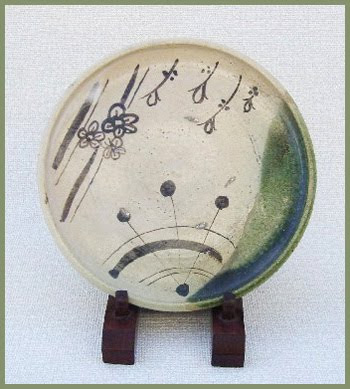 Oribe Pottery is part of the Mino tradition.
. Mino Pottery Reference . 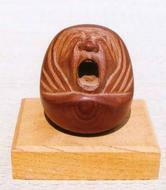 There are many types of ORIBE pottery. Talking about Oribe, I should mention the Tea Ceremony, but I keep that for a different story. Just as I am writing this, on May 26, 2002 The Japan Times featured some articles about Green Tea and the Tea Ceremony, so you might have a look. In the town of Toki, there is a special Oribe Festival on August 3 and 4, 2002.
. Reference : Oribe Festival . There is a Museum with Oribe and Shino Pottery. 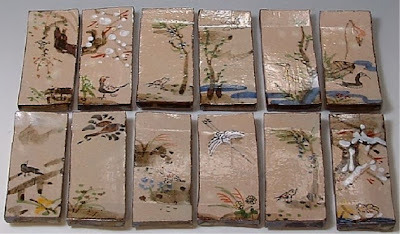 "Ceramics are closely connected to the tea ceremony and central to Japanese culture. In this context Oribe wares represented a unique and major development, since they were the earliest Japanese ceramics to carry extensive multicolor decoration. Boldly painted with geometric and naturalistic designs, they display sensuous glazes, especially in a distinctive vitreous green, as well as a whole repertoire of playful new shapes. These dashing wares matched the vigorous, extroverted, rapidly changing world of the warlords. Their genesis has traditionally been ascribed to Furuta Oribe (1543/44-1615), a warrior and the foremost tea master of his time, who appears to have played a crucial role in redefining the aesthetics of Japan. Over seventy engaging vessels of Oribe ware, along with striking examples of other types of wares produced in the same milieu, make up the heart of this catalogue." "During the era of Oribe, a common aesthetic language bound all the visual arts more strongly than at any other time in Japan before or since, and intimate working relationships existed among artists in different media. The forces that nourished this creative energy, the transformations that occurred, and the splendid works that resulted - together constituting the subject of this catalogue - are discussed by twenty distinguished scholars." 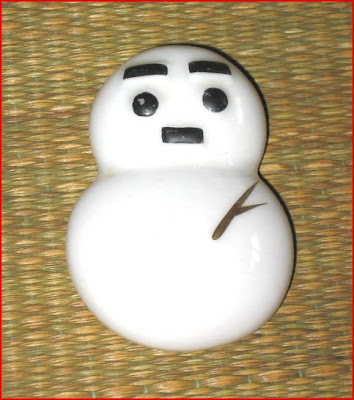 Now have a look at my Daruma in Oribe style, standing a tall 21 cm high. His little toes are showing under the robe and his face has the eccentric features of Old Oribe himself. 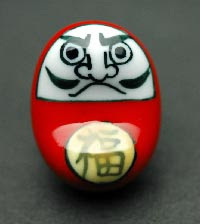 Daruma statues in the Oribe style are very seldom. Another typical piece of Oribe pottery are the oil dishes (aburazara 油皿), to be put under a portable room lantern (andon 行燈). 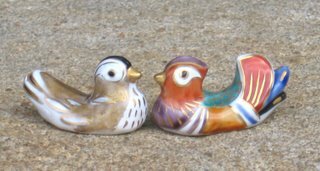 They were frequently used in every household until the electric light took over. 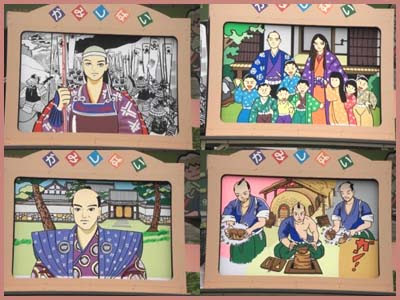 In the following interesting article in English you get an overview about the illumination during the Edo period. Finally the oil dish of my collection. 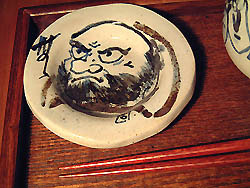 The little Daruma is painted with a few abstract strokes only, the body almost forming a spiral. Diameter 21 cm. Sesame is an important ingredient in Chinese cooking and used in many preparations. Since Chinese quisine is very popular in Japan too, sesame is used as cooking oil, as hot-spiced oil (ra-yu 辣油 ラーユ) with chilli peppers or in many variations of black or white sesame seeds on the table to put on rice or in soup (iri-goma いり胡麻)。Freshly roasted sesame seeds are especially delicious, hence this seed roasting pot for home use. Short information about the SESAME plant. Sesamum indicum or orientale cultivated for its seeds since ancient times, found chiefly in the tropics of Africa and Asia. Sesame seeds, also called bennes or gingellies, are black or white and yield an oil that resists turning rancid. The oil (known also as teel oil) is used extensively in India for cooking, soap manufacture, food, and medicine and as an adulterant for olive oil. The seeds are also popularly added to cookies and other baked goods and are made into candy (e.g., benne cakes). Sesame was introduced by African slaves to the U.S. South, where it sometimes becomes a weed. The sesame was once credited with mystic powers. Sesame is classified in the division Magnoliophyta, class Magnoliopsida, order Serophulariales, family Pedaliaceae. 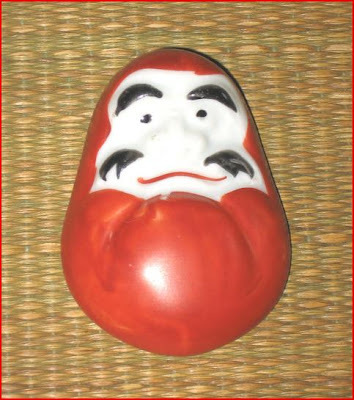 This piece with a lovely humorous Daruma san is from the early Showa period. 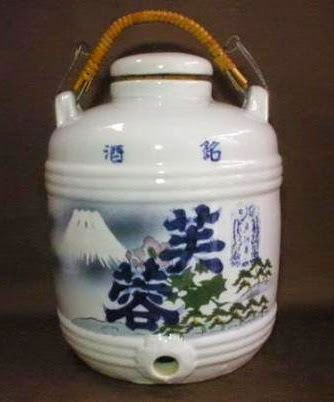 This is a kind of hooroku pot for roasting things. Photo from my friend Ishino. 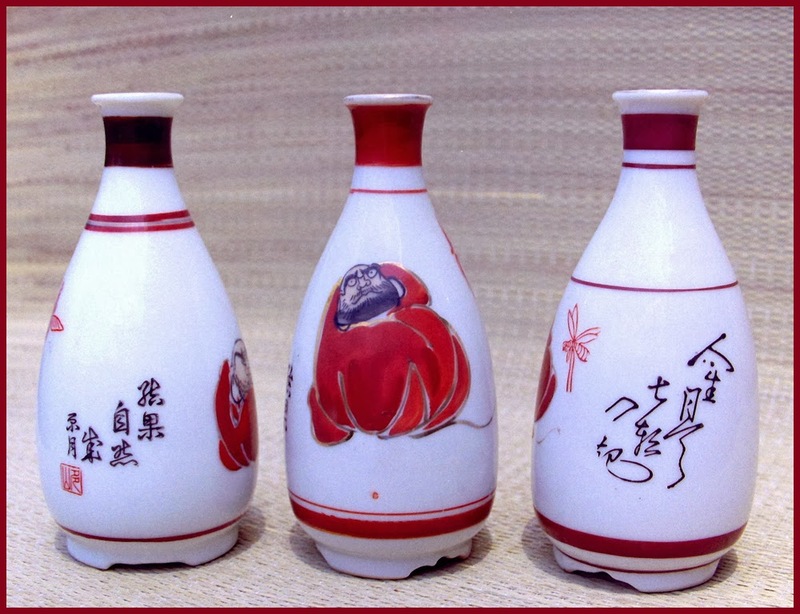 A sake flask with the three gods of good luck and a small plage with Daruma as decoration. 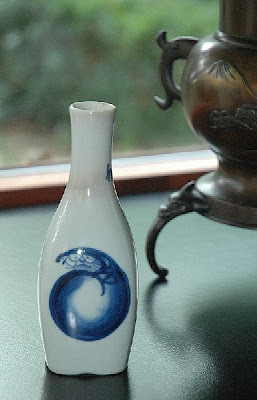 Generic term for ceramic flasks used to warm and serve sake, usually with a narrow neck for retaining heat. Tokkuri come in all shapes and sizes. Usually holds about 360 ml. of sake. 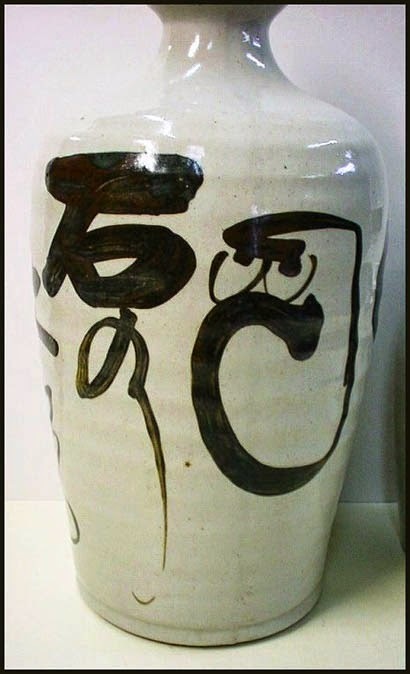 The most popular styles are Bizen, Iga, Shigaraki, Imari, and Mino. Click here to learn about each of these styles in our Pottery Guidebook. 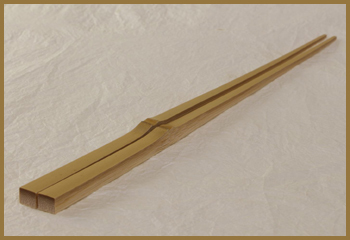 Choshi is another term for tokkuri, but most often choshi are made of metal and have a handle. You can find all the necessaray information about Tokkuri and their various forms on this extensive HP of Robert Yellin. 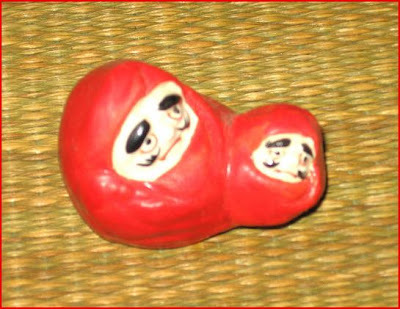 in form of a turnip (kabura 蕪). There is also an article about the ZEN of Tokkuri. Robert Yellin has a lot more stories about Tokkuri. This TOKKURI is a traditional Japanese item not only in the YAHO area but everywhere in Japan during the early Showa period. 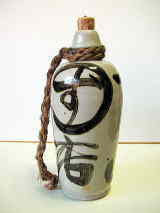 A KAYOI-TOKKURI was used to buy SAKE at a store and carry it home in the bottle. Usually it belonged to the store and had the name of the store in big Chinese letters written on it. The neck part was formed to hold back a string for carrying the bottle and nowadays it is closed with a cork. This kind of tokkuri was also used for buying soy sauce.
. . . CLICK here for Photos of "Binbo Tokkuri"! 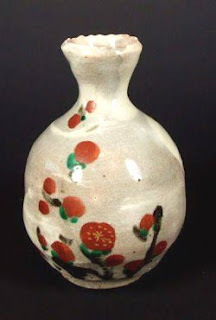 It might also be a plum blossom design on a sake flask. 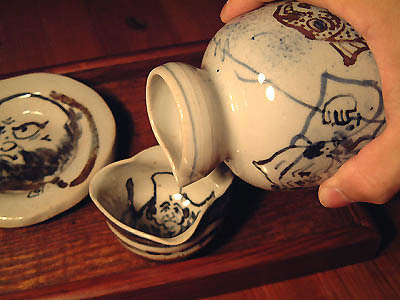 When sake is served hot, it is put in a small pottery bottle called tokkuri. The tokkuri is placed in a hot bowl of water until the sake reaches the correct temperature (about 50 degrees C), although many Japanese use microwaves today. You can read a lot more about making and drinking sake from the extensive HP of this Sake Museum. There is also a Japanese HP. The bills were usually payed before the New Year to have a clean account book.
. last payment of the year, kakegoi 掛乞 かけごい .
. 大福帳持ち福禄寿 Fukuroju with an account book . the four liter wine barrel. Here Basho recollects a line of poetry from Tu Fu. This sake bottle now changed into a flower vase. For a while Li Po and Tu Fu shared a brief friendship, exchanging poems with each other. Li Po is thought of as being earthy, while Tu Fu as that of the moon. Li Po is at his best when drunk and happy, like a lark singing at heaven’s gate. Tu Fu wrote his best poems when angry, like a nightingale singing with his throat against a thorn. Nearly a thousand years passed and Basho helped perpetuate their poems in his own writing .
. Matsuo Basho - Saga Nikki 嵯峨日記 Saga Diary . 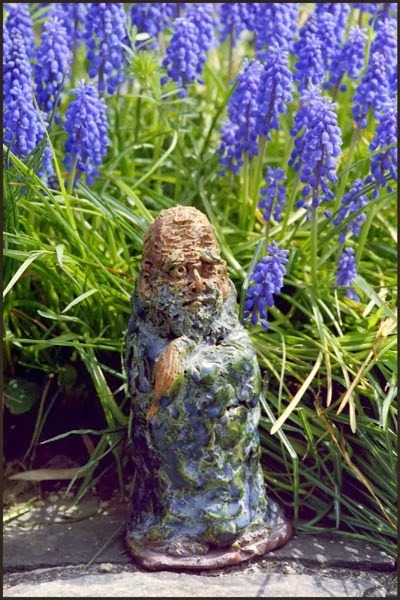 they are often offered to Shrines and displayed there. 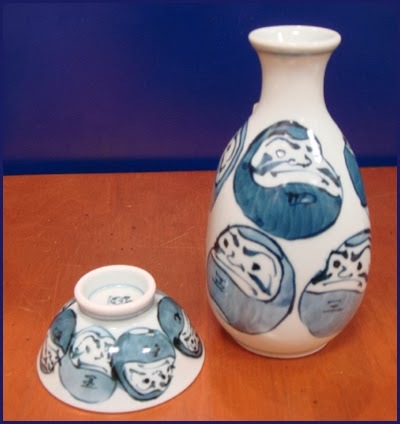 Here are two samples with Mount Fuji decoration. Click on the photos for more!
. 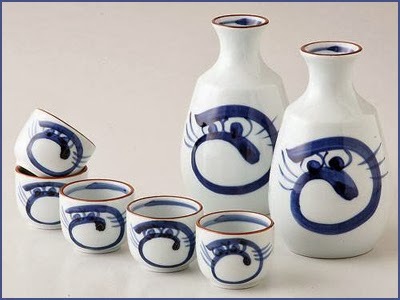 Sake 酒 for rituals and festivals . Hasami is located close to Arita and Imari, but not nearly as famous. Its manufacturers historically focused on mass-market ceramic products for ordinary Japanese people.
. Hasami-yaki 波佐見焼 Hasami creamics - Nagasaki . is tableware similar to a spoon rest, used to keep chopsticks away from the table and also to prevent used chopsticks from contaminating or rolling off tables. They are made in various shapes from clay, wood, glass, or precious stone such as jade. 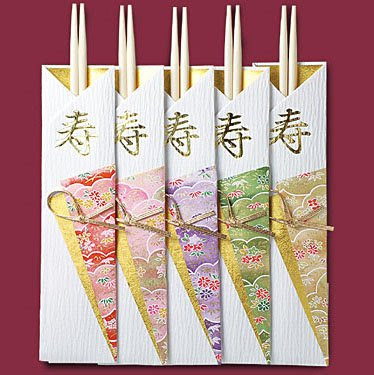 Some people prepare them from bags of half-split disposable chopsticks in origami manner. 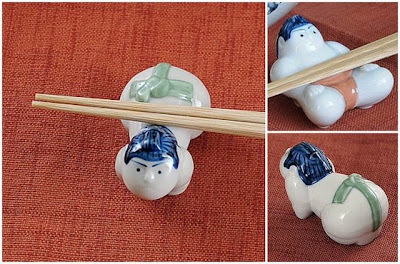 In Japan, chopstick rests are usually used at formal dinners and placed on the front-left side of the dishes. The chopsticks are placed parallel to the table edge with the points toward the left. They come in many forms, patterns and colors. The origin dates back to Shinto offerings with food for the deities, where the chopsticks made from bamboo could not simply put on the tray. 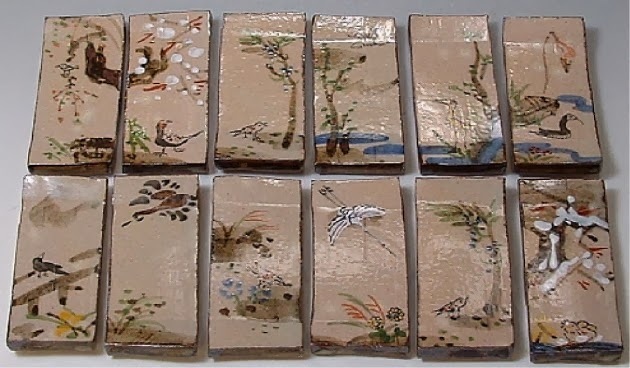 So they were placed on a small clay wrapper, later used as hachioki.
. shinsen 神饌（しんせん） Shinto- Food offerings .
. Aritayaki 有田焼 Arita Pottery .
. Inoshishi イノシシ　猪　「亥」 Wild Boar .
. Okame and Hyottoko as a chopstick rest . They make a great present for a student during exam times. The fourth day of the eighth month. Rikyuu bashi, Rikyu hashi 利休箸 chopsticks "a la Rikyu, the Tea Master"
made from Yoshino Sugi trees, both sides are rounded to pick up food. Sen no Rikyu used these wooden chopsticks for his tea ceremony meetings. The wooden pattern (masame 柾目) is all aligned n one direction and they have a special fragrance. 中平両細 the middle is flat, both sides are thin. This means, both sides can be used for eating, but one side is for man to eat, one side is for the deity (kami 神) to partake in the food. During festive occasions, the deities were always part of the common feast. CLICK here for PHOTOS ! 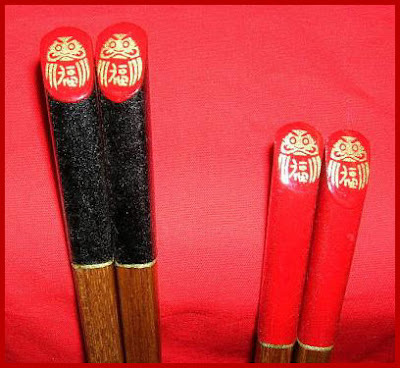 両口箸 chopsticks with two "sides for the mouth"
chopsticks for everyday , 片口箸 chopsticks with "one side for the mouth"
元禄 genroku: with six corners, named after the Genroku period of Edo. For different dishes chopsticks from Bamboo with the node at different places are used. These chopsticks are important for the Kaiseki food served at the Tea Ceremony. - Nakabushi, Motobushi, Ryoboso, and Sugibashi. Each style is distinguished according to the course and the type of dishes served. Nakabushi is used for grilled fish and hasun, which is equivalent to small shared plates much like tapas. Motobushi is used for shisakana, which are simple snacks that accompany alcohol. Ryoboso chopsticks are tapered at both ends and are used to serve many of the courses of the tea ceremony - such as the azukebachi (much like a tagine servingware used to serve simmered seafood and vegetables), shisakana, and pickles. Sugibashi is shorter and thinner than the rest, which made them perfect to serve condiments and smaller dishes. Chopsticks made from bamboo used to be washed after use and used again. Around190 years ago, stalls selling grilled eel became popular in Edo and their owners found it cumbersome to clean the chopsticks, it was also a problem of cleanliness for a roadside vendor. So they developed hiki waribashi 引割箸, the fore-runners of our present-day "use and throw away" chopsticks. They were in use in Edo, Kyoto and Osaka since around 1818. Chopsticks made from bamboo used to be washed after use and used again. Around 190 years ago, stalls selling grilled eel became popular and their owners found it cumbersome to clean the chopsticks, it was also a problem of cleanliness for a roadside vendor. So they developed hiki waribashi 引割箸, the fore-runners of our present-day "use and throw away" chopsticks. 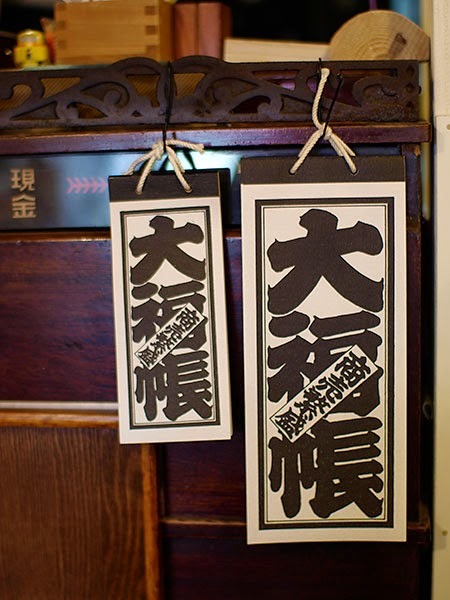 They were in use in Edo, Kyoto and Osaka since around 1818.
. chin shoobai　珍商売 strange business in Edo . kuri 栗 sweet chestnut tree and kaki 柿 persimmon tree. 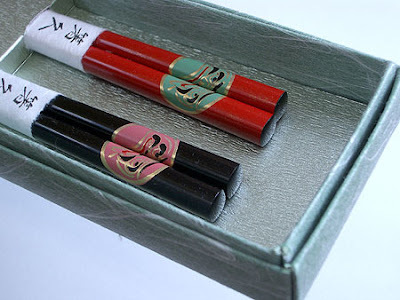 Bamboo chopsticks were often covered with urushi 漆 laquer to make them last even longer and look nicer. The surface of the wood was softened with a small kanna 鉋 plane. Thus they got a lot of small wood chips. These were burned in summer to ward off mosquitos, who do not like the smoke. 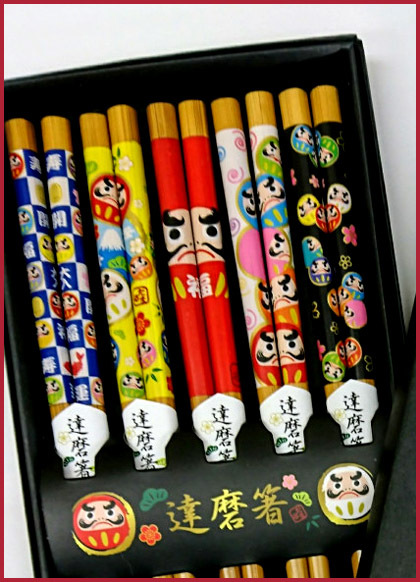 Edo Kibashi chopsticks have been created by the hands of Tokyo craftspeople since the beginning of the Taisho Period (1912-1926) roughly 100 years ago. 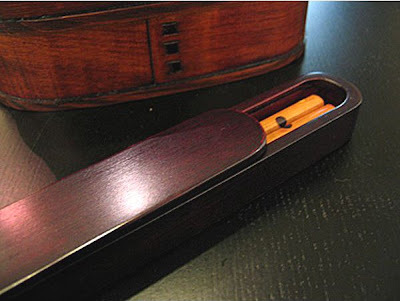 Edo Kibashi use carefully selected high-grade wood (ebony, red sandalwood, ironwood, Japanese box-trees, maple, etc. ), which craftspeople plane by hand. With a focus on ergonomics, they are designed for easy grip and pragmatic functionality. 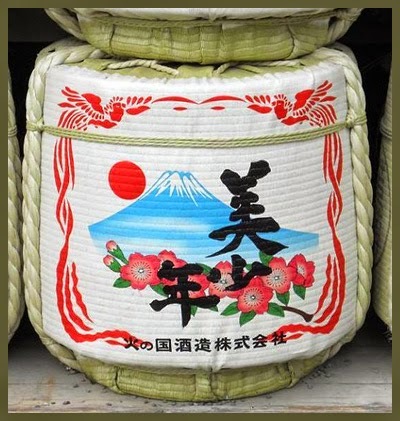 In the early stages of their development, a square design called dobari, or stretched trunk, was the standard form. 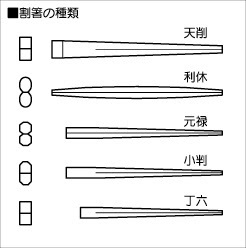 However, the craftspeople recognized that every person has a different sense of grip, with varying preferences for the length, width and weight of their chopsticks, and Edo Kibashi craftspeople began to manufacture chopsticks in various shapes, including squares, pentagons, hexagons, heptagons, octagons and simple circles. With so many different features and characteristics to choose from, it’s easier for the purchaser to select chopsticks that fits his or her preference. Expressed through design, this kind of concern for the user’s needs is what makes Edo Kibashi so special. 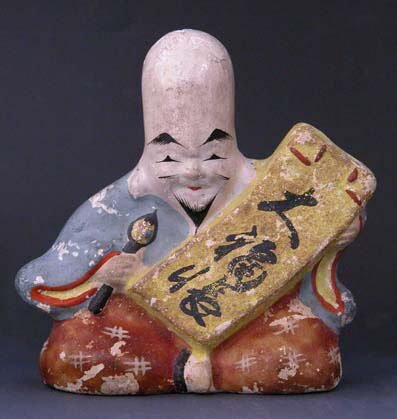 owner of the Daikokuya Edo Kibashi store, originated the name Edo Kibashi in 1999. Daikokuya has inherited the history and tradition of Edo Kibashi, and continues to ambitiously develop designs that pursue the utmost in utility.
. Edo craftsmen　江戸の職人 shokunin .
. zooge no hashi 象牙の箸 ivory chopsticks . The original Ukiyo-E is a beauty blowing a glass ball poppen, which the designer for this shop has re-done to suit his merchandise.
. 喜多川歌麿 Kitagawa Utamaro . 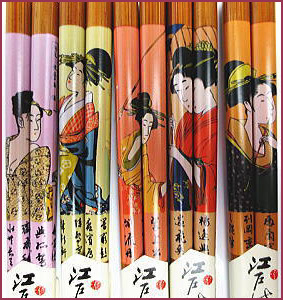 There are also chopsticks with small Ukiyo-e design.
. Join the Ukiyo-E friends on facebook ! . One of the more popular items to come out of Japan last year was Kotobukiya's "Star Wars" Light Saber Chopsticks, which made the rounds on popular tech blogs such as Gizmodo, Wired and TechCrunch's CrunchGear. And while they might not have "the force" (nor the brand power) of any "Star Wars" product, Japanese company Daiwa Toy (www.daiwatoy.co.jp) has a similar set of chopsticks that will be sure to make a splash among Japanophiles and densha otaku (train geeks) the world over. The shinkansen chopsticks — also known as the "Chopstick Express" — take the form of Japan's famous bullet trains. If you've ever taken the shinkansen, it's quite possible that you bought a boxed lunch to enjoy during your trip. Can you think of a more fitting pair of chopsticks with which to dine on a train? I don't think so. Unlike the actual shinkansen, these chopsticks are not divided up into multiple cars, but rather each chopstick is crafted into one long, sleek car that gives the impression of a train rocketing down the tracks, a mere blur to the human eye as it zooms past. Because the form of a chopstick tapers off into a narrow tip, the illusion of perspective is easily created, making this miniature replica appear deceptively long. For extra dramatic effect the package design includes railway tracks underneath each train, as well as a tunnel near the bottom out of which the chopsticks appear to be racing out of. 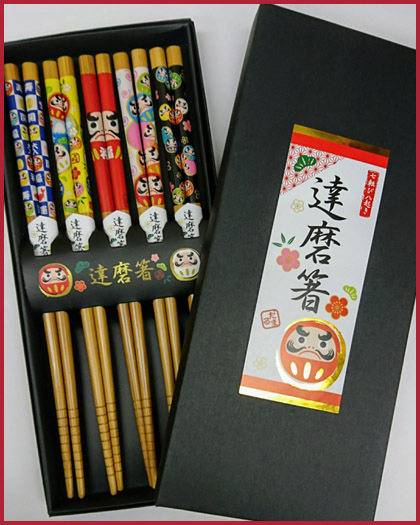 While many people will buy these shinkansen chopsticks with the intention of using them to eat, the elaborate and beautiful package makes an excellent display case should you opt to show off your pair on the mantle. Included among the varieties of shinkansen are the 0-Series train. That was the first shinkansen to be introduced, in 1964, and it was only retired in 2008. The recent N700-Series train is also available, this being the latest model to hit the tracks just three years ago. According to Daiwa Toy, the N700 chopsticks are 21 cm long and other models will be comparable. In total, four different kinds of shinkansen will be produced, giving train fans and collectors a sizable collection. For anyone who would like to pick up a pair of their very own shinkansen chopsticks they can be purchased at Yamashiroya in front of JR Ueno Station, but you can expect to see them on sale in more and more station kiosks in the future. 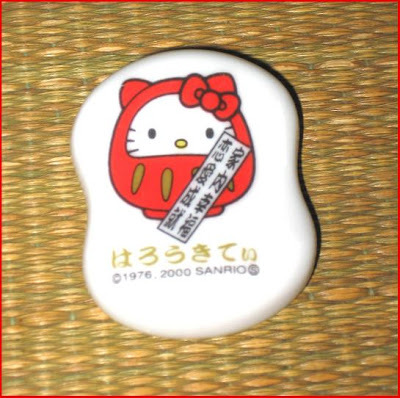 Alternatively, if your Japanese is up to snuff, you can buy them online at (www.eki-net.biz/j-retail/g109001). Chopsticks have become a quintessential part of the Japanese, Chinese and Korean culinary experience across the globe, with more than one fifth of the world's population using them daily to eat. 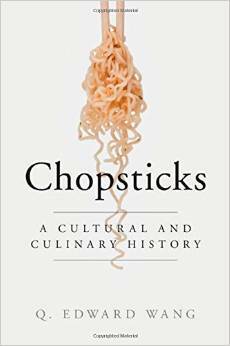 In this vibrant, highly original account of the history of chopsticks, Q. Edward Wang charts their evolution from a simple eating implement in ancient times to their status as a much more complex, cultural symbol today. Opening in the Neolithic Age, at the first recorded use of chopsticks, the book surveys their practice through Chinese history, before exploring their transmission in the fifth century to other parts of Asia, including Vietnam, Korea, Japan and Mongolia. 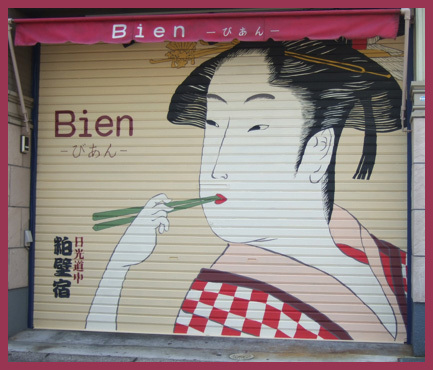 Calling upon a striking selection of artwork, the author illustrates how chopstick use has influenced Asian cuisine, and how, in turn the cuisine continues to influence chopstick use, both in Asia and across the globe. Its festival is on the 24th day of the 10th lunar month. As a food offering nabedango ナベダンゴ meat balls are prepared, with three pairs of special chopsticks made from wood of the peach tree and kaya 茅 miscanthus. One pair must be longer than the other two.
. 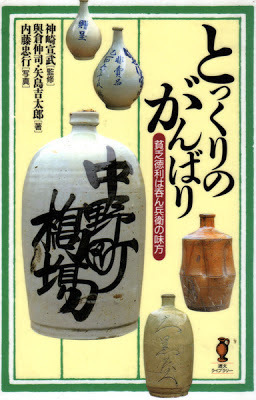 Sake 酒 rice wine for regional rituals . Essstäbchen wurden in China bereits um 1500 v. Chr. verwendet und kamen zusammen mit dem Buddhismus im 7.Jhd. nach Japan. Nicht nur die Stäbchen, sondern auch viele Speisen wurden aus China übernommen und dann im Laufe der Zeit an den japanischen Geschmack angepaßt, insbesondere die vielen Versionen von Nudelsuppen. Ramen. Das Essen ist immer so zubereitet, daß man es einfach mit den Stäbchen aufnehmen kann. Japanische Suppe wird in handlichen Schalen zum Trinken serviert und die Einlagen mit den Stäbchen herausgefischt. Für einen Eintopf, an dem sich alle bedienen, gibt es ein Paar besonders lange Stäbchen für alle zum Umrühren und Herausholen einer individuellen Portion (sashibashi). Gegessen wird dann mit den eigenen Stäbchen. Essstäbchen werden aus den verschiedensten Materialien hergestellt, meist aus Holz oder Bambus mit Bemalungen oder farbig lackiert, neuerdings aus Kunststoffen oder wertvolle aus Elfenbein und Edelmetallen. Das eine Ende der Stäbchen, die immer in einem Paar mit zweien geliefert werden, ist etwas dünner und so erkennt man deutlich, welche Seite in die Hand gelegt wird und welche für die Speisen vorgesehen ist. Die Gegend um Wajima ist besonders bekannt für die Herstellung von Lackstäbchen in allen Größen und mit vielen Mustern. Für Ehepaare gibt es ein Set von unterschiedlich großen Stäbchen mit dem gleichen Muster (meotobashi). Für Kinder werden beliebte Manga-Figuren aufgedruckt, so daß zu Hause jeder seine eigenen Stäbchen leicht erkennen kann. Im Restaurant werden Einmalstäbchen aus Holz in Papierhüllen ausgelegt. Sie hängen an der hinteren Seite zusammen und man erfaßt sie zum Auseinanderziehen vor der Brust so, daß die Griffseite vom Benutzer nach außen weist, stemmt dann die beiden Stäbchen leicht zur Seite bis sie auseinanderknicken. Nun sind sie gebrauchsbereit. Die Papierhülle kann man geschickt zusammenfalten und als Auflage für benutzte Stäbchen verwenden. Nach dem Essen steckt man die Stäbchen dann halb in die Hülle zurück und knickt den vorderen Teil um zur Anzeige, daß dieses Paar benutzt wurde. Umweltbewußte Menschen gehen mit ihren eigenen Stäbchen aus (maihashi). Für diese eigenen Stäbchen gibt es kleine Kästen zum Aufbewahren. Auch beim Lunchpaket stecken die eigenen Stäbchen in einer Seitentasche. Der große Schrein in Suwa in Nagano verkauft Amulette mit speziellen Essstäbchen (kajikibashi), die zum Essen von Wildfleisch verwendet werden sollten (kajiki no men), um sich keiner spirituellen Verunreinigung zu unterziehen, da ein frommer Buddhist kein Fleisch von vierbeinigen Tieren essen darf. Andere Tempel verkaufen Amulette mit einem Satz Essstäbchen für ein Kleinkind, das zum ersten Mal mit Stäbchen essen darf, denn dies ist ein wichtiger Tag im Wachstum eines Kindes. Oma und Opa bringen diese Stäbchen zum Festessen der Familie mit. Wenn nicht in Gebrauch, liegen die Stäbchen mit der spitzen Seite auf einer kleinen Stäbchenbank, damit sie das Tischtuch nicht beschmutzen. Diese Stäbchenbänke sind oft kleine Kunstwerke aus den verschiedenartigsten Materialien mit allerlei lustigen Motiven; es sind beliebte Sammlerstücke und Reiseandenken. Vor dem Essen beugt man leicht den Kopf und sagt „Itadakimasu“ (ich nehme daran teil) und nach dem Essen, wenn die Stäbchen ordentlich abgelegt sind „gochisoosama“ (es war ein Festessen, „chisoo“ bedeutet eigentlich „herumlaufen“, weil der Gastgeber sich viel Mühe gemacht hat und herumgelaufen ist, um alle frischen Zutaten zu bekommen). Die Reisschale und die Suppenschale sind „beweglich“ und dürfen immer bis zum Mund angehoben werden, alle anderen Schalen und Schälchen bleiben stehen und man nimmt die Bissen mit den Stäbchen auf. Die Suppe ist keine Vorspeise, sondern wird abwechselnd mit den anderen Speisen getrunken. Für Sashimi und Tempura stehen kleine Schälchen mit Sauce bereit, in die man noch nach Geschmack geriebenes Wasabi oder geriebenen Rettich hineinrührt. Die einzelnen Bissen werden erst in die Sauce getaucht und dann zum Mund geführt. Sushi darf auch mit der Hand aufgenommen und in die Sauce getunkt werden. Essstäbchen sind einfach nur eine Verlängerung der Finger zum Erfassen von Speisen ... also keine Angst, es ist ganz einfach. Das japanische Essen wird immer in mundgerechten Happen serviert, es besteht also keine Notwendigkeit, etwas zu schneiden, zu zerkleinern oder aufzuspießen. Die Reisschale ist eine „bewegbare Schale“ und kann als eine sicher „Unterlage“ dienen, indem ein Bissen zunächst mit den Stäbchen vom Teller einen kurzen Weg bis über die Reisschale transportiert wird, die man mit der linken Hand nahe an den aufzugreifenden Happen bringt. Nun führen beide Hände den Bissen über der Schale bis in sichere Mundnähe, und wenn er doch unterwegs runterfallen sollte, dann nur auf den Reis ... es ist also nichts passiert und er kann jetzt zusammen mit dem Reis aus der Reisschale gegessen werden. Das eine Stäbchen ist „unbeweglich“ und wird zwischen den Ring- und Mittelfinger der rechten Hand eingeklemmt. Dabei kommt das dickere Ende in die Hautfalte zwischen Daumen und Zeigefinger zu liegen. 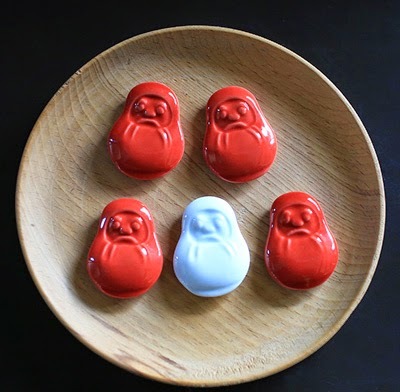 Das andere Stäbchen ist „beweglich“ und wird mit Daumen und Zeigefinger zum Greifen gelenkt. Auf keinen Fall die Stäbchen senkrecht in den Reis stecken, das wird nur bei Trauerfeiern zum Gedenken des Verstorbenen gemacht. Kinder lernen das Essen mit Stäbchen schon recht früh, nachdem sie mit einem Löffel anfangen, Speisen zum Mund zu schaufeln. Sie lernen auch die verschiedenen Tischmanieren im Zusammenhang mit Stäbchen. Kein Aufspießen von Speisen, auch wenn das manchmal bei rutschigen runden Kartoffelstücken der einfachste Weg wäre! Wenn ein Bissen im Mund verschwunden ist, sollten die Stäbchen wieder auf ihren Parkplatz gelegt werden, bis der Bissen durch langsames Kauen richtig genossen ist. Die Stäbchen immer mit der dickeren Seite nach rechts auflegen. Nicht in einer Speisenschale herumstochern, um eine besonders leckeren Bissen herauszufischen. Immer eins nach dem anderen von oben nach unten abtragen. Nicht mit den Stäbchen wie mit einem Zeigestab herumfuchteln, um auf einen Gegenstand oder eine Person im Zimmer aufmerksam zu machen. Auch nicht mit den Stäbchen einen kleinen Speisenteller in die Nähe ziehen, dazu sind die Hände da. 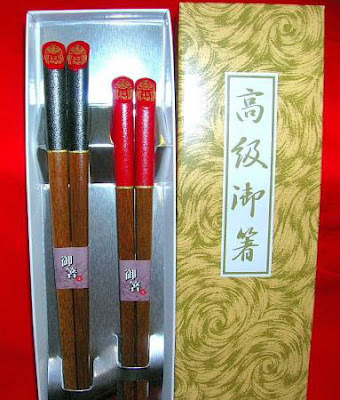 futobashi 太箸 (ふとばし) "thick chopsticks"
They are made from wood of the sacred willow tree. They are thick in the middle, to represent two full bags of rice. 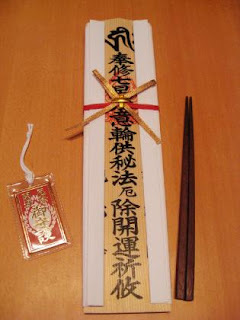 The ends are thinner for eating, one side for the human, one side for the deities to participate of the first meal. It is usually very colorful. KAN means : hot soup. Maybe he was trying to eat some soba noodle soup at a cheap shop near the station in Hokkaido. When he realized he could not break the chopsticks in one fine cut, he became aware of his own sticking to details.